We maintain better client satisfaction and perfection in working, we are preferred by many established construction companies and government organization to conduct and do their works. The company is having two high-end pumps. The pumps carry its own pipeline and accessories and are equipped with a water tank and flushing water pump. 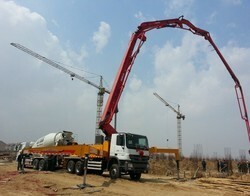 The pumps are having S-tube transfer system for pumping concrete in a smooth manner. 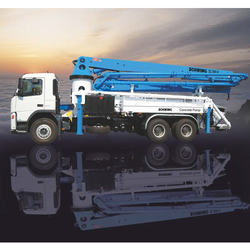 The pumps are made with German technology and supplied by Schwing Stetter India Pvt. Ltd.
- 350kw, 3 Concrete pumps facility with 100 mtr pipe line. - Transits Mixers by Ashok Leyland, Model no.2516.